There was no fog on the Tyne last night but there was a point for the Clarets with an equaliser five minutes from time, just one minute earlier than George Boyd’s equaliser on our last visit to St. James’ Park. After being somewhat fortunate to go in 0-0 at half time, we conceded a goal with twenty minutes to go before claiming a point with an own goal credited to Newcastle goalkeeper Karl Darlow, with both of those goals came from corners. This is a trip we’ve made so rarely over recent years and it is one I look forward to although I was a bit disappointed it was the away game selected for midweek. That meant an early afternoon departure from Burnley. It was cold and we were in a hail shower on departure. On arrival at Newcastle we were greeted with dry weather but considerably colder. Getting out of the car close to the river, I can’t remember ever arriving for a game of football and it be so cold. That meant the walk to the ground had to be broken with a traditional stop for refreshments. We chose one close to the railway station and made our way up to St. James’ Park around half an hour before kick off. It’s a pretty imposing place from the outside and, before anyone asks, I did not walk up the 148 steps to the away section. Not for the first time I was thankful for the lift option, although I did walk down at the end of the game. The team news came through and our team was as expected with Kevin Long and Ashley Westwood coming in for the injured James Tarkowski and Steven Defour; Defour’s absence leaving Jack Cork as the only ever present in the league this season. Newcastle included new loan signing Kenedy but out of the side were such as Jacob Murphy, Jonjo Shelvey and Dwight Gayle, all of whom had played in the previous Premier League game. Before looking at the match itself, there have to be a few words regarding the Newcastle fans who are not a happy bunch right now and haven’t been for most of the time Mike Ashley has been the club’s owner. 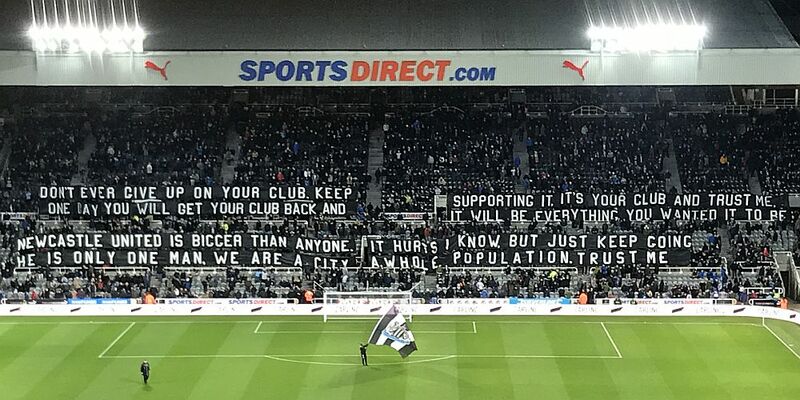 Recent news of another collapsed takeover has done nothing other than add to the frustration and last night there was a very visible protest from the Wor Flags group within the seats at the Gallowgate End which included an old quote from Kevin Keegan. There’s no need for me to quote the words on the banners; just take a look at the photograph at the top of this report. They are not the only fans at war with their owners and, to be fair, they are somewhat better off than those at such as Blackpool, Charlton and Coventry, certainly in terms of league position, but there is no doubt that Ashley has done himself no favours during his time on Tyneside and there has to be a great deal of sympathy for those supporters. They certainly have mine; I’ve seen the effects at Burnley when supporters and board were not, should we say, as one. It’s not perfect at Burnley, but is it ever at any club? But it’s certainly a lot better for us than it is at many other clubs and we really should be thankful for that. It’s toxic for the Toon and just a few miles away it’s certainly no bed of roses at Sunderland, if I’m permitted to mention them in a report covering a Newcastle game. As for the game, there’s not a lot of positivity to mention from a first half when Newcastle, struggling to buy a win at home, were the better side and they will probably come off thinking they should have been in front. We had our opportunities. Even the Sky commentary team felt we should have had a penalty when Cork went over Paul Dummett. Seconds later Ashley Barnes had the ball in the net only for the goal to be ruled out for a foul, and Barnes, almost on half time, saw a shot from the edge of the box curl wide when it looked as though it might just sneak in. But Newcastle probably had more chances and they certainly had better chances and Kenedy was often at the heart of it. They’d already had one good chance when he fired a shot against the post. It seemed to take a deflection off Ben Mee and Nick Pope certainly got a hand to it. But the ball dropped nicely for Christian Atsu who missed the chance of the half so far with a shot straight at the recovering Pope. Kenedy and Joselu were involved when they really should have taken the lead. Referee Simon Hooper, whose performance was bad enough to deserve a report all of its own, got this decision right, pointing to the spot after Phil Bardsley had brought down Kenedy. I’ve had my moans about every penalty we’ve conceded this season with Bernardo Silva, Aaron Ramsey, Glenn Murray and Dele Alli all getting the benefit from their exaggerated actions. This time there really was nothing to question; Bardsley simply got it wrong. Burnley and Newcastle were two of the four Premier League teams not to score from the penalty spot this season; that’s still the case with Pope going to his left to save Joselu’s poor effort. If you don’t take your chances, you don’t score goals and so we were able to go in at 0-0 even though, on the balance of play, Newcastle really should have been ahead. For the second successive away game we’d been disappointing in the first half although, given the changes we’d had to make, this was more understandable. But again, as at Palace, we did improve after the break although it did eventually look as though we were going to come home pointless. We were certainly looking more likely in the opening exchanges of the half and, with an hour gone, Sean Dyche brought on latest signing Aaron Lennon for a debut, the 70th player to play league football for us since the appointment of Dyche as manager. He got a warm reception from the Burnley fans and almost immediately provided us with a bit of excitement down the left hand side. But that was completely flattened just a few minutes later when Jamaal Lascelles got away from Long at a corner to head home and give Newcastle the lead. And it might have been worse a few minutes later when Joselu fired wide with another opportunity. That really was the end of Newcastle. Sam Vokes came on with twenty minutes to go as we went 4-4-2 and that was followed in the closing minutes with the introduction of Georges-Kévin NKoudou. We started to put Newcastle under pressure. When Lennon got onto a ball in their box it ultimately led to our equaliser but it required a bit of good fortune and another poor refereeing decision. Yes, one went our way. Lennon fired in a shot from a very tight angle that Darlow saved at the expense of a corner on the left. Cork sent the ball down but there was no one there to take it so Cork eventually went. Mee headed the corner over the bar but, for some reason, Hooper awarded us another corner. Cork it was again who took it. This time Long headed it as far as Vokes and his header was goal bound until Darlow got enough of a touch to tip it onto the underside of the bar. The goal line camera shows the ball almost certainly coming down to drop on the line, but Darlow, in his attempts to rescue the situation, could do no more than knock it into his own goal. We’ve only ever once previously benefited from an own goal in the Premier League. It came at the same end of the same ground just over three years ago when Paul Dummett scored our first in that 3-3 draw. Embed from Getty ImagesRight from the kick off, Newcastle got forward and substitute Matt Ritchie played a ball across goal that went out for a goal kick beyond the far post. That’s the last we saw of them at our end. We pushed forward looking for a potential winner but once into stoppage time, and there were four minutes of it, we looked like a team that had settled for a point. All away points in the Premier League are good points and it’s incredible to think that we are now in February and have lost just three times this season on the road, more so when we look at last season’s record. We might still be looking to end this run without a win but we have, at least, broken the run of defeats which is important given who we play next. There were some positives and Lennon is certainly one. I’m sure he’s going to be a good acquisition for us and at times last night his quality shone through. We know we have injury issues. It’s a long time since we had this many players out and there are a good number of them potentially unlikely to play again this season. Thankfully we’ve one or two coming back a lot sooner, but for those panicking, that’s another point, it’s 35 now. For those with their glass half empty, that was enough to keep you up last season. It might take a few more this year, the bottom three do have more points than they did at this time last season. For those whose glass is half full, like mine, we are nearly there, we are close to securing third successive season in the Premier League. Will that bring us another trip to Newcastle? In many ways I hope so, it’s always a good place to visit, but a Saturday afternoon next time would help. Newcastle: Karl Darlow, Deandre Yedlin, Ciaran Clark, Jamaal Lascelles, Paul Dummett, Mikel Merino, Mohamed Diamé, Christian Atsu (Jacob Murphy 64), Ayoze Pérez (Dwight Gayle 85), Kenedy (Matt Ritchie 72), Joselu. Subs not used: Freddie Woodman, Javier Manquillo, Isaac Hayden, Jonjo Shelvey. Burnley: Nick Pope, Phil Bardsley, Kevin Long, Ben Mee, Charlie Taylor, Jόhann Berg Guðmundsson (Georges-Kévin NKoudou 83), Ashley Westwood (Sam Vokes 70), Jack Cork, Scott Arfield (Aaron Lennon 60), Jeff Hendrick, Ashley Barnes. Subs not used: Anders Lindegaard, Matt Lowton, Fredrik Ulvestad, Nahki Wells. Yellow Cards: Ashley Barnes, Sam Vokes. Attendance: 50,174 (including 1,907 Clarets). Click HERE to vote for the man of the match.